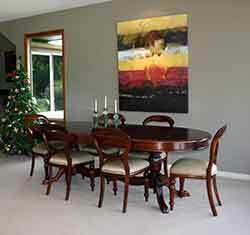 Matahui Lodge serve gourmet meals produced by your hosts using the best of the Bay of Plenty's fare. The Bay of Plenty is famous for growing and producing some of the worlds best foods. Local orchards grow the creamiest avocados on the planet. The Bay of Plenty is also the kiwifruit capital of the world. As the name suggests the Bay produces plenty of top quality fruits and vegetables and we use them all, in season, to produce gourmet meals that surprise and delight. Meat and fish is sourced from local producers and treated with the respect that top quality produce deserves. Kay produces freshly baked breads, pastries and scones fresh from her kitchen daily. 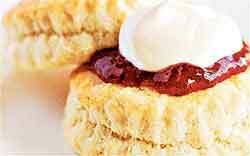 Is there anything more delicious than a freshly baked scone with home made preserves for morning tea? Guests are encourage to share any food, wine or beer preferences thus allowing Kay and Trevor to tailor an unforgettable menu.. They are happy to cater for special dietry requirements such as gluten free or dairy free. Contact us to discuss your food and drink wishes. Breakfast is included in the price of your stay. Dinner is available for $70 per head including wine. Exceptional value for such gourmet fare. Eggs benedict - poached free range eggs on English muffins with hollandaise sauce. Hearty lodge breakfast - Bacon, tomatoes, hash browns and eggs cooked to your liking. Stuffed chicken breast with creamy mustard sauce. Wild venison with green peppercorn and brandy sauce. Pears and apricots baked in wine and vanilla syrup served with hot gingerbread and marscapone. A wide selection of craft beers and local and international wines are available to choose from. Select your choice from Trevors purpose built wine cellar. There is something to suit every taste. Rich dark reds from Hawkes Bays famous Gimblett Gravels or pungent zesty sauvignon blancs from the internationally renowned Marlborough region. 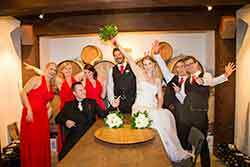 Wine tasting in the cellar has become a popular pastime for guests of Matahui Lodge and guests are more than welcome to partake in a variety of New Zealand wines.. 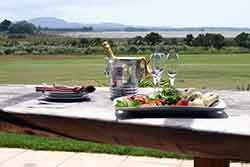 Eating Al Fresco with views of Tauranga Harbour. Formal indoor dining is an alternative to Al Fresco dining on the patio. Home made breads and scones baked daily. 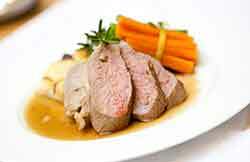 Gourmet meals prepared by your hosts using quality local ingredients. Our above ground, purpose built wine cellar is a popular place for guest to congregate. 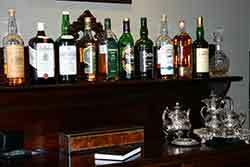 A wide selection of beverages for pre dinner drinks are included in the price of your stay.